The dedicated Boston, MA garage floor installation crews work to create the perfect garage floor, using high performance materials and a professional level of service that is unmatched. Choosing the right garage flooring company is of most importance, if you desire to have a beautiful garage floor that is to last in our harsh New England weather. The abuse the garage floors take in Boston, because of these adverse conditions, is extreme and a floor must be stronger than the concrete underneath to withstand such conditions. All of Boston Garage’s flooring options are of an eco-friendly, hybrid polymer blended composition, which is both durable and luxurious and, most importantly, made in the USA. Boston Garage offers over 100 different flooring options, but regardless of which one is chosen every variation remains attractive and resistant to wear for years. 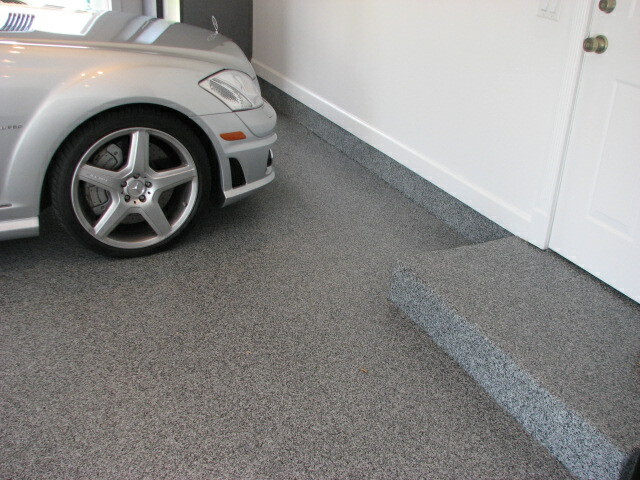 Boston Garage’s flooring is able to do so because it is UV resistant, and, unlike other garage flooring methods, it bonds directly and permanently to a garage’s preexisting concrete, instead of simply coating it. This means that Boston Garage’s garage floors are immune to spills, and that they retain their luxurious appearance for years after installation. The majority of the garage flooring we install here in Boston, MA already has an existing coating prior to our arrival, and for one reason or another it did not last. It is important to note that inexpensive materials and botched processes that either the PT “Professional” has used or those of the DIY variety are typically the cause of such garage flooring failures. We recommend using only the best quality garage flooring available and hiring a professional that specializes in garage flooring and makes it their life’s work. Dedicated specialists in their field that have been trained, certified and work under strict standards will provide the level of service needed to create a beautifully installed garage floor that will lasts for many years.